It’s Friday!!! And I’m back with a little 2 part post (it’s gonna get a little personal today!) for you that includes a recipe that would be absolutely perfect for your weekend. 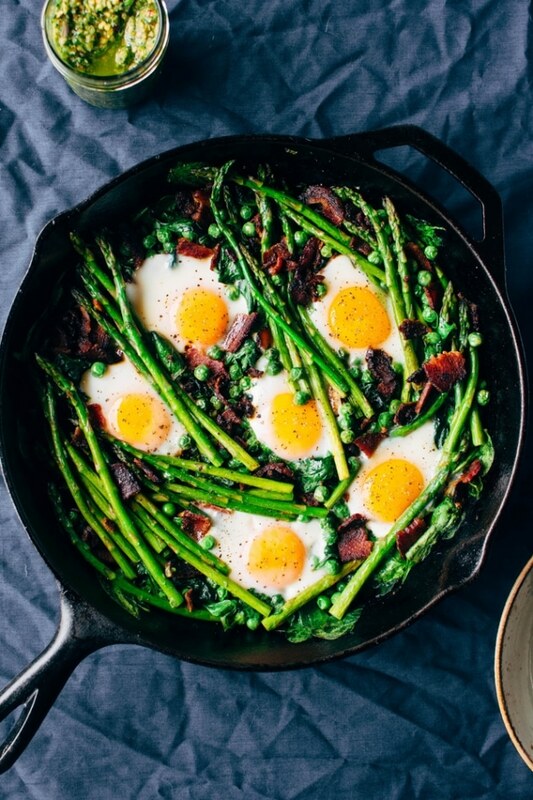 It is an easy spring veggie egg skillet with bacon and herbed almond pesto, and it’s to die for! I mean doesn’t it just say “spring” in the best way with all that green?! I always feel like a new season breathes new life into my cooking. With all the different ingredients popping up at the market + grocery store, spring time is really the most refreshing of them all. Suddenly everything comes up GREEN! Asparagus, peas and baby spinach are the veggies I chose to include here, but you could easily swap them out for whatever beautiful green vegetables you find at your local spot. And all these green veggies really make my heart happy – I’ll bet you’re feeling those fresh vibes, too. Even if the weather is not quuuuite there yet (I’ve got a lot of patience for this city), our hearts and stomachs are, right?! And green food in a skillet with EGGS?! And BACON?! Now we’re pretty much living the dream. 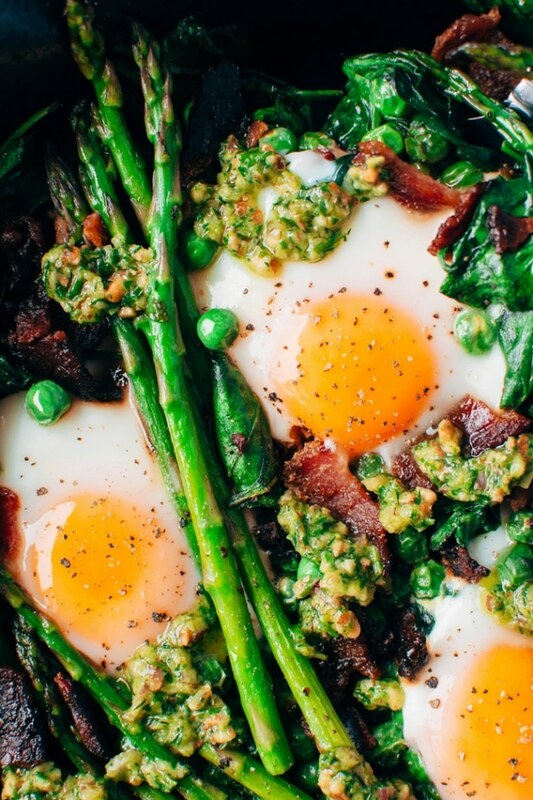 And to make this whole breakfast // brunch skillet situation even better, it’s finally the weekend! 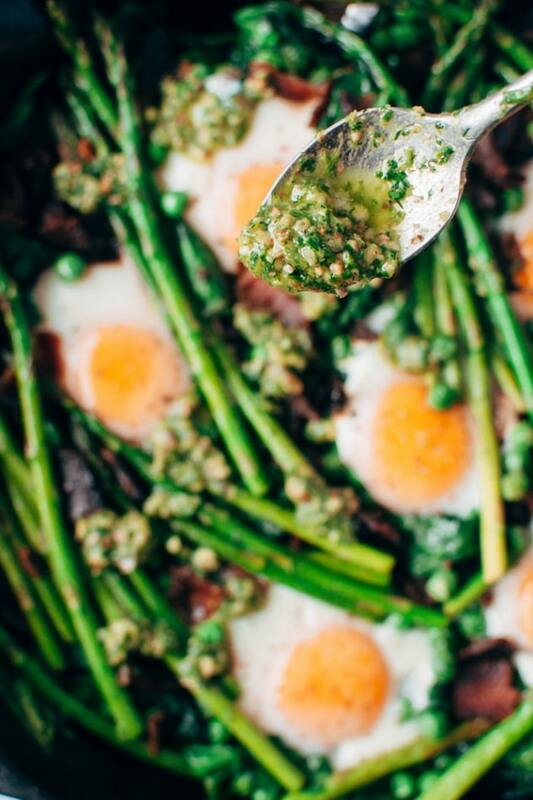 Which is the perfect excuse to pop a bottle of champs for mimosas, squeeze some fresh juice to go with it, and make this totally easy and so VERY spring egg skillet with bacon and herbed almond pesto. 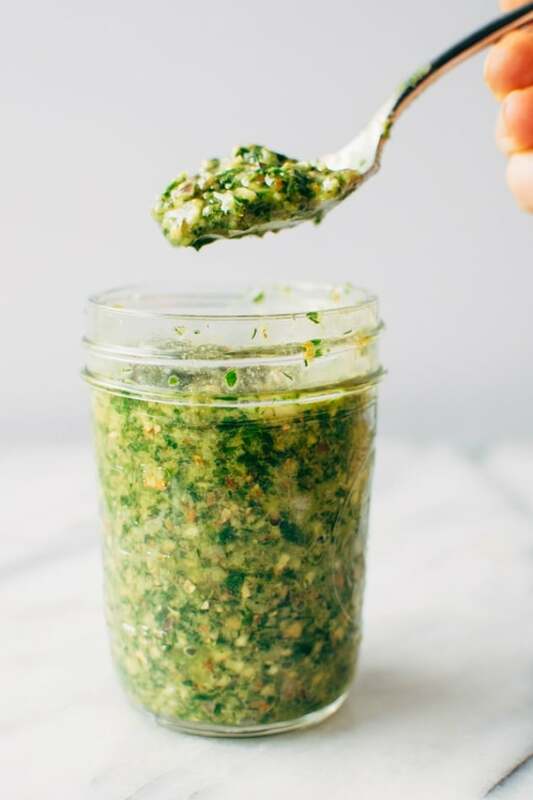 Speaking of herbed almond pesto, I’m gonna go ahead and profess my love of this little jar of green goodness right here, right now. 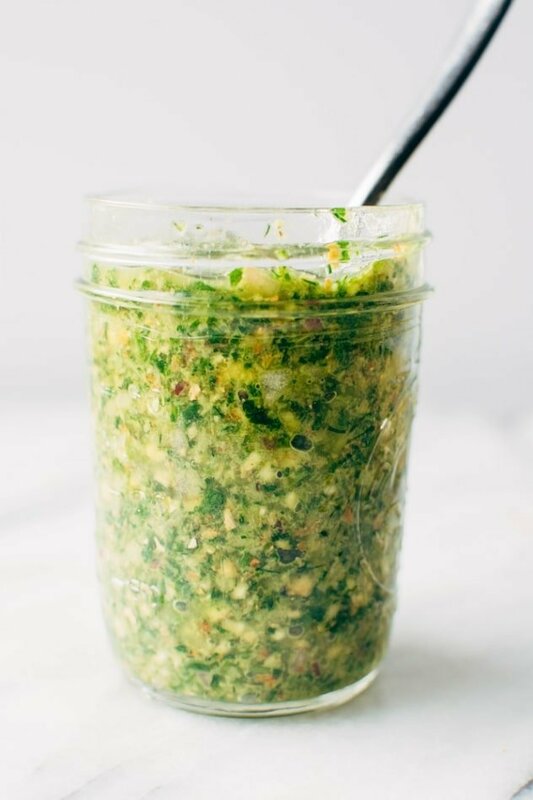 As you guys know, sauce situations are my favorite situations, and this herbed almond pesto is no exception. It packs a major awesome flavor punch. The skillet on it’s own is really tasty, don’t get me wrong, but when you pulse a BUNCH of fresh herbs together with some red onion, almonds, olive oil and vinegar and drizzle it over the top? Well the whole thing is brought up to the next level. Leveling up. Get ready for the personal part of this blog post today. Leveling up is something I’ve been thinking about A LOT lately. There’s this little voice in my head that’s been chiming in lately about taking some steps to level up the blog + make an honest assesment of where I’m at with this online space and where I want to be. Pinpoint what my next goal is. What more I can do to enhance YOUR experience interacting with the content I’m putting together for you. I’ve gotten pretty comfortable writing a couple blog posts a week, sharing them with you and doing it all over again the next week. But like any creative minded person who cares about the impact of the things we create, our minds often move ahead to think about “What’s Next”. How can I level up on this situation and ultimately create a better more comprehensive resource for you? Or as Bjork and Lindsay Ostrom like to say over at Pinch of Yum and Food Blogger Pro – find a way to embrace “1% infinity”. Meaning if we can always get 1% better at what we’re doing, and do this over the long term, that we will always be improving and getting closer to our goals. So now I ask you – what is something that you would like to see more of on the blog? Are there any types of recipes that you would LOVE to see more often? Would you flip if some of my recipes had videos accompanying them? Or maybe you have some serious questions about going grain-free // paleo that you think I could answer. I’m honestly so open to your suggestions and ideas! You guys are the reason I’m here and I want to make sure that what I’m building and putting out to you every week aligns with the very things that you feel like you need more of in your life. I have eternal gratitude to you for logging in every week and engaging in this whole process, and I want you to feel the love! I wouldn’t be here if it weren’t for YOU and all the energy that you circulate back my way. I couldn’t not .. but seriously though, I am so blessed and you’re the reason, so thank you. * If you have any ideas about how I could level up to give you the BEST possible experience and create the most VALUE in your life, I would be so honored if you would send them my way. I can be reached by the contact form here on my site, or by emailing me directly at nyssaskitchen@gmail.com. 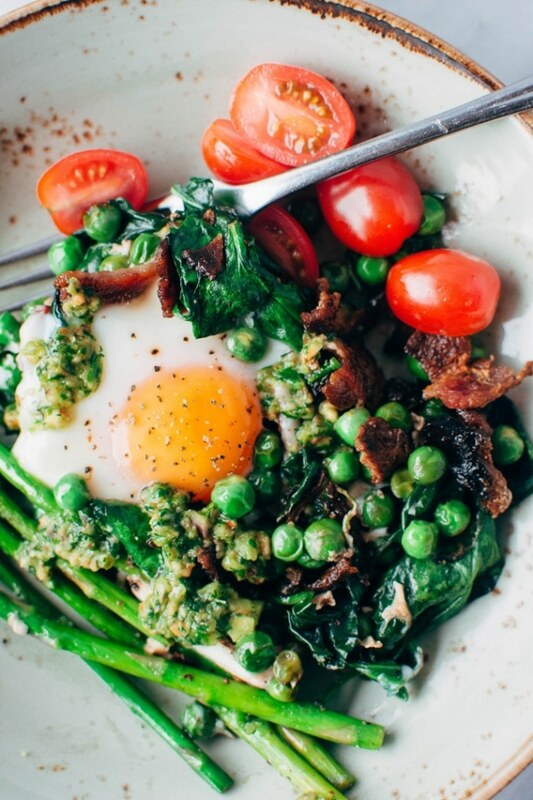 Easy spring veggie egg skillet with bacon and herbed almond pesto made with asparagus, peas, baby spinach, bacon and pastured eggs is the perfect spring brunch dish for you and yours! Fry bacon over medium heat in frying pan until fairly crisp. Move to a paper towel to drain and cool. Add asparagus stalks, season with a sprinkle of salt and saute, until bright green, about 2 minutes, depending on thickness of stalks. Add peas and saute for 30 seconds, add spinach and saute, tossing until just beginning to wilt. Season peas and spinach with a big pinch of sea salt. 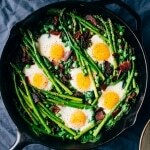 Add asparagus and crumbled bacon back to the skillet. 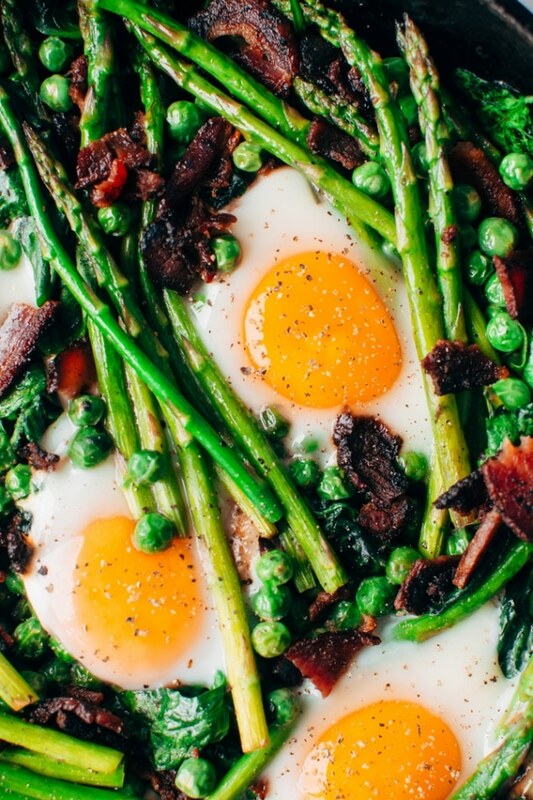 Create little pockets for eggs amongst the veggies , and crack one at a time into waiting spaces. Sprinkle eggs with salt and pepper and cover pan, cooking for about 8 minutes, until eggs are set and yolks are still runny. Add almonds and herbs to food processor and process until well chopped, but not totally smooth. Add avocado oil, white wine vinegar, salt, coconut sugar and red onion and pulse until incorporated. Season to taste with salt and serve over the top of the egg skillet! This entry was posted in breakfast and tagged gluten free, grain free, healthy, paleo, quick, sauce, whole30 on March 31, 2017 by Nyssa Tanner.